Montreal makes riding easy, with 300 miles (480 km) of bike paths and 300 self-service BIXI bike-sharing stations (click here for bike availability in real time). There is a beautiful waterfront loop that begins at Atwater Market, a huge indoor/outdoor expanse of local-, organic- and exotic-food stalls. From there, it's a short ride on bike lanes to Les Berges Cycle Path, which runs 13 miles (21 km) through a greenbelt along the St. Lawrence River. 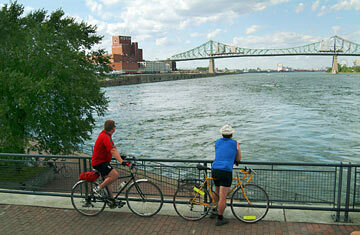 The stunning views include the Lachine Rapids and Saint-Pierre Lake. At the western end of the path, it's worth taking a detour into the long, skinny peninsula that is René-Lévesque Park, home to 22 huge sculptures; from there, you can link to the Lachine Canal path, which heads north, back into central Montreal. When you return to Atwater Market, ice cream awaits at Montreal favorite Havre aux Glaces.